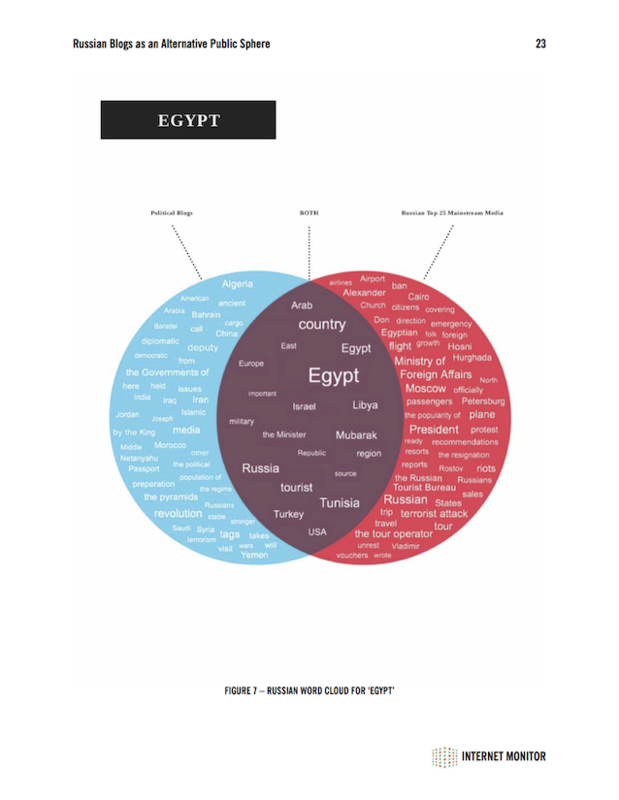 This diagram compares words used in the same sentence as the ‘egypt’ in Russian political blogs vs. mainstream media during the time of the Egyptian December 2010 revolution. You can see at a glance that the two spheres share only basic geography and some concern for tourists. Other than basic geography, the mainstream media are additionally interested in the attacks only through foreign ministry expressions of concern for Russian tourists. In strong contrast, the political blogs are interested in the events as a ‘revolution’ in the context of the larger topic of unrest in the Middle East. Applying a combination of quantitative and qualitative methods, we investigate whether Russian blogs represent an alternative public sphere distinct from web-based Russian government information sources and the mainstream media. Based on data collected over a one-year period (December 2010 through December 2011) from thousands of Russian political blogs and other media sources, we compare the cosine similarity of the text from blogs, mainstream media, major TV channels, and official government websites. We find that, when discussing a selected set of major political and news topics popular during the year, blogs are consistently the least similar to government sources compared to TV and the mainstream media. We also find that the text of mainstream media outlets in Russia (primarily traditional and web-native newspapers) are more similar to government sources than one would expect given the greater editorial and financial independence of those media outlets, at least compared to largely state-controlled national TV stations. We conclude that blogs provide an alternative public sphere: a space for civic discussion and organization that differs significantly from that provided by the mainstream media, TV, and government. Comments closed — Trackbacks closed RSS 2.0 feed for these comments This entry (permalink) was posted on Tuesday, April 29, 2014, at 10:59 amby hroberts and categorized in surveillance.